Charles Billy Massey, age 85, of Smithfield, passed away on August 7, 2018. 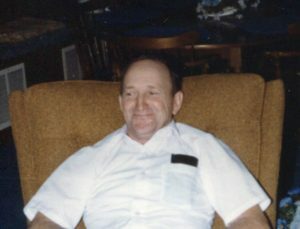 Born in Johnston County on July 18, 1933, he was the son of the late Charles Patrick and Lela Mae Ingram Massey. He was also preceded in death by a son, Charles Oliver Massey and a sister, Helen Massey Butts. Mr. Massey owned and operated Massey’s Wheel Alignment in Selma for 32 years. He was a member of West Calvary Free Will Baptist Church and Gideon’s International. A graveside service will be held on Saturday, August 11, at 11:00 AM in Selma Memorial Gardens with Rev. Donnie Massey and Nathan Massey officiating. The family will receive friends at Parrish Funeral Home in Selma on Friday from 6 to 8 PM. Surviving are his wife, Joyce Faye Hatcher Massey; son Tony Massey and wife Kathy of Smithfield; daughter Sharon Massey Kelsey of Smithfield; daughter-in-law Iris Massey of Selma; brothers James Massey (Clarris) of Princeton, Jerry Massey (Trudy) of Shoeheel, and Donnie Massey (Diane) of Stancil’s Chapel; sisters Margaret Wiggs of Saulston, Jessie Smith of Pikeville, Betty Dale Martin (Jerry) of Texas and JoAnn Creech (Herman) of Holly Springs; grandchildren, Chuck Massey, Brad Massey, Lela Geist, Nathan Massey and Caleb Massey; and twelve great grandchildren. Memorial contributions may be made to Gideon’s International by mailing checks to The Gideons International Processing Center, P.O. Box 97251, Washington, DC 20090-7251.